The Pound-to-Rupee rate was trading around 91.17 on Monday after rising more than half a percent in the previous week, although the outlook for the pair has turned bearish in recent days after a head-and-shoulders reversal pattern formed close to the recent highs on the charts. Sterling fell at the start of last week after it the government requested from Brussels only a very short delay to the Brexit process. However, it later recovered some of its loss after the EU left the door open to a much longer extension of the Article 50 negotiating window, and potentially an indefinite one if Prime Minister Theresa May fails again to get the EU Withdrawal Agreement through parliament. Pundits are still suggesting she will struggle to win enough votes for her deal to be approved next week so there is at least one fundamental reason for why the Pound could rise during the week ahead as a third failure of the Withdrawal Bill to clear parliament might see the market fixate on the odds of Brexit being abandoned by the government or prevented through a second referendum. From a technical perspective, the outlook for the exchange rate is bearish. The pair has formed a large head and shoulders (H&S) reversal pattern composed of a peak high, which forms the head, and two slightly lower peaks either side that are the shoulders of the pattern. A break below the neckline at the base of the pattern, which is located at 88.00, would provide confirmation that a deeper decline down toward the 80.00 threshold is in the cards. That target is equivalent to the height of the pattern extrapolated lower. Above: Pound-to-Rupee rate shown at weekly intervals. The exchange rate is currently being supported by the 200-week moving-average located around 90.90. The market will have to break clearly below this large obstacle before more downside can be expected. The pair failed to sustain a break below 90.90 last week and, while in the process of reversing higher, it formed the bearish head and shoulders pattern now present on the charts. The market now needs to break beneath the hammer’s low at 89.60 to confirm more downside to the 88.00 neckline. Any break below the neckline at 88.0, on a daily closing basis, would open the door for deeper declines. The descending channel that can be seen on the daily chart is also bearish, although again a clear break below the 89.60 lows is necessary for confirmation of a more protracted fall. The most important release for the Indian Rupee in the week ahead is the current account balance for the final quarter of 2018. 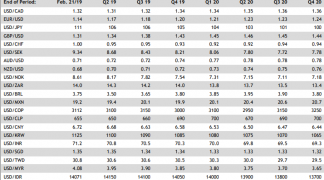 The current account defict was -$19.1 bn in the third-quarter of 2019. There is no consensus estimate yet available for the current account balance although the Brent oil price is around $13 lower than it was at the end of the third quarter and the trade balance has duly fallen since that time. The trade balance is a key component of the current account balance. Current accounts measure changes in the amount of money flowing into and out of an economy as well as movements in borrowing from the rest of the world. Currency markets care about the data as it paints a telling picture of international demand for a currency and provides insight into the extent to which a nation is exposed to the changing sentiments of international investors. With foreign direct investment and portfolio securites put to one side, the other key component of the current account is the trade in goods and service balance. Trade balance data measures the difference in value between a nation's imports and its exports. Currency markets care about trade balances because the data provides insight into supply and demand of a currency in the "real economy", while also giving a steer on the likely pace of GDP growth in a given period. Above: Indian current account balance. Source: Tradingeconomics. Recent analysis from Goldman Sachs suggests that oil prices are more likely to rise in the future as global demand outstrips supply. That could mean both the trade and current account balances widen because India has to import substantially all of the oil it consumes and when prices rise, more money leaves the country. The other key background event for the Rupee in the week ahead is the ebb and flow of expectations relating to the general election due to be held in April and May, with results announced on May 23. Consensus is that the governing Bharatiya Janata Party (BJP) will win that a lack of an absolute majority will produce a coalition government. There is a risk the Rupee will fall going into the election because of uncertainty about the likely outcome, but weakness shouldn't last for long if the outcome is as polls suggest. While rising oil prices plays negative for the Rupee, the bearish decline in GBP/INR all through March tilts the outlook to marginally bearish, given the old adage that ‘the trend is your friend’ - more weakness is, therefore, expected.